When we first saw fried pickles on the menu of our local Mexican restaurant, Poco's, we thought they sounded disgusting. But about a year later we finally decided to just try them and WOW, were we glad we did! They are the most unusual things, but surprisingly very tasty. They are a bit addictive too.. we'd find ourselves talking about going to Poco's just to get the pickles. We decided to stay in tonight so that gave me some extra time to cook. 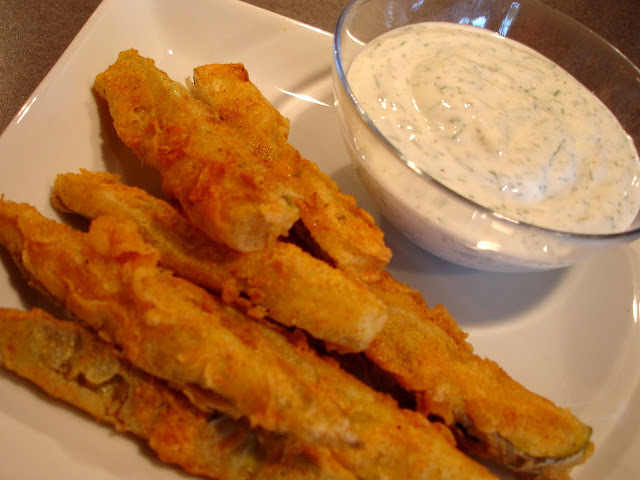 I found a recipe for fried pickles on the Food Network Website and then found this recipe for a yogurt-dill dip which is what Poco's serves them with. Combine all ingredients in a small bowl. Chill. Combine 1 1/2 cups flour with ground red pepper, garlic powder, salt, and paprika. Blend well. Fry coated pickles in 375-degree oil until golden brown. Drain on paper towels. The Result....The dip was excellent and the pickles were pretty good. The flour mixture didn't stick to the pickles all that well, so next time I'll use bread crumbs and spices instead of flour. They have those everywhere in the south. They are really good. I've only had them cut into thin circles, though. I saw a show on the food network that mentioned fried pickles and I thought that they sounded interesting. I want to try them! that dip sounds so good! I will have to book mark this for next time I make pickles!